LITERALLY, How far are you willing to go for your dog, DAILY? If it seems like a loaded question, it sure is. Even though I am a Pro Dog walker, I will find that many of my weekend excursions are typically much closer to home. Not sure if that is an age thing, or having a small child to care for, but nowadays I just don’t travel the very long distances I used to in search of the best dog park. We still do two walks per day. Of course having been in the pro dog walking business for a long time, I have already found most of those secret legal off lead dog walking areas near me, and of course in summer,with snake activity, choices are cut down considerably. But the question remains, how far do you or your dog loving friends regularly go out of your way to go to the best park for your dog? 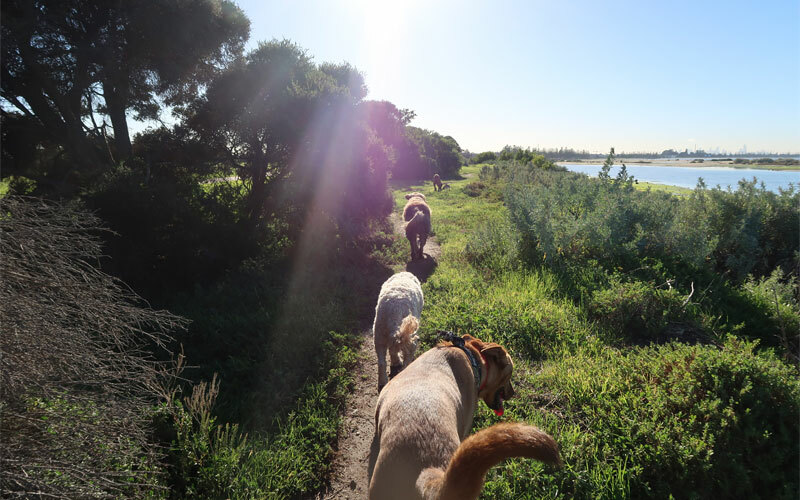 Here is something you might not have considered about what a dog walk really needs to be about for the best outcome for your dog. Once a week, I go a long distance down a highway to pick up some legacy dogs (owner moved to a suburb far away). And I keep that routine up for her dogs, and also as a very exciting one off thing for my dog and the other very lucky dogs on that day of the week. We go to a river/ bay area that has just about everything that a dog could want. How my dog loves running along the grass, up and down banks, into the water, digging and its an absolute hoot! But more than that, its something that he only gets one day a week. People forget that while humans and dogs are creatures of habit (we like routine), routine in dog walking areas often bores the hell out of dogs and humans. If you know everything you are going to encounter, if you have sniffed every tree and bush a million times before, what is the challenge? Dogs are still as close as , most humans get to big wild animals, and under that domestic exterior and all the rules we have taught them, they really relish encountering new environments. The only time this doesn’t initially work is if they are in a perpetual state of anxiety from some puppy or dog rescue treatment. But that is the whole point of dog walking, bringing a dog back to balance, and happiness. So while the local block walk might be terribly convenient for many people, or even if you manage to regularly get to the closest off lead dog park, if you do that every day of your dog’s life, both of you are really missing out on the joy of discovery and a dog making good decisions on its own. That is how you get a balanced dog. You are making a dog that can handle unexpected situations, have it live its life to the fullest by finding new areas to explore.